The entire piece drops 3 1/2” from a black natural leather cord that can be adjusted from 18” to 36” so it can be worn a variety of lengths from close to the neck to very long. THIS ITEM WILL NOT BE SHIPPED OUTSIDE THE UNITED STATES. 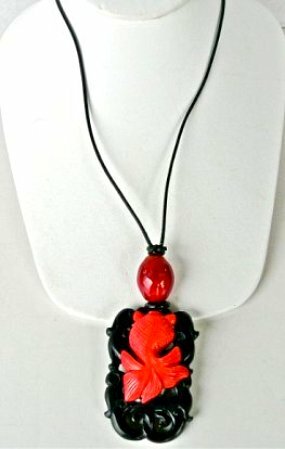 This is a dramatic combination of black onyx and red coral. The onyx is a beautifully carved double dragon with lots of cut out areas. Suspended on top is a intricately carved red coral fish showing his tail, eyes and scales. On top of the pieces is a hand blown glass bead with swirls of different colors of red. The dragon is the imperial emblem of the Emperors from the Han period, the coat of arms being two dragons contesting the fiery pearl. The dragon, a supernatural creature, is the symbol of power, strength, wisdom and goodness and represents the utmost in attainment: good luck and success in life. It is also believed to be the guardian of hidden treasures. It represents the spirit of growth and change. Onyx is the gem of the midnight hour. Coral is formed from the shells and skeletons of sea animals.